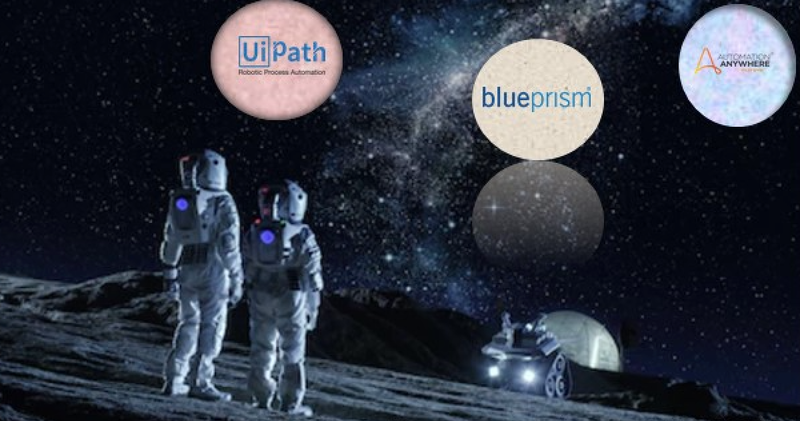 It's not been possible to escape the wild world of RPA valuations these past few months, culminating in the recent claim from UiPath and its investors that the firm is worth $3 billion, despite the reality that AA's annual revenues this past year are ~$100m, Blue Prism's ~$55m and UiPath's ~$65m (HFS estimates). 1. RPA directly replaces people. This is incorrect, its all about augmenting processes and the improving the quality of the workforce, not eliminating actual employees with bots. As our recent State of Operations Study with KPMG, across 381 Global 2000 operations leaders, illustrates, only 7% go into automation expecting direct FTE reduction. Consequently, the C-Suites from 70% of these organizations are happy with the ability of RPA to reduce reliance on labor. Hence RPA augments labor, it doesn't replace it. 2. RPA can scale rapidly to have a dramatic impact on enterprises in months. Incorrect. The vast majority of these initiatives are project-based, not scaled - only 13% of RPA adopters are currently scaled up and industrialized, according to new data from 590 enterprises worldwide. Most RPA adopters are still tinkering with projects and not rushing towards enterprise scale adoption. 5. RPA will be a unique game-changing product in the market for years to come. Incorrect. Most organizations take a couple of years to learn and understand how to incorporate the benefits of RPA, but after that it's merely a tool in the enterprise toolbox. 7. Valuations of $2/3 billion per firm are realistic. Incorrect. While software vendors such as Mulesoft and Marketo have recently fetched insane multiples of $5bn-$6bn, these are very established IT applications that augment multi-billion dollar industries. RPA tools are supporting backend automations that require a very unique combination of business/IT aligned delivery, as opposed to being front-end apps that can be sold to IT budgets en masse. RPA is a BandAid, not your new enterprise platform. These are not the typical products an SAP or Oracle can easy ingest into their apps portfolios - the needs are too process heavy, too consultant dependent to fit their sales models. RPA has dramatically altered the narrative among middle/back office process owners. We predict a market approaching $2 billion this year alone and growing fast as traditional process outsourcing models are hugely impacted. We've even gone as far as declaring RPA the "new outsourcing". RPA has been a major game changer in the world of operations and outsourcing.... but $3 billion valuations of software firms barely hitting $50m in revenues? We don't think so... let's learn to keep nurturing this great business and not squeeze it until it breaks. While the industry is busily adding fancy new words to their résumés and job titles, we have to remember that our technological journey is gradual. Change comes slowly and incrementally and you can't just rip off the proverbial Band-Aid, hire a bunch of Millennials and Gen-Z kids... and it's mission accomplished. 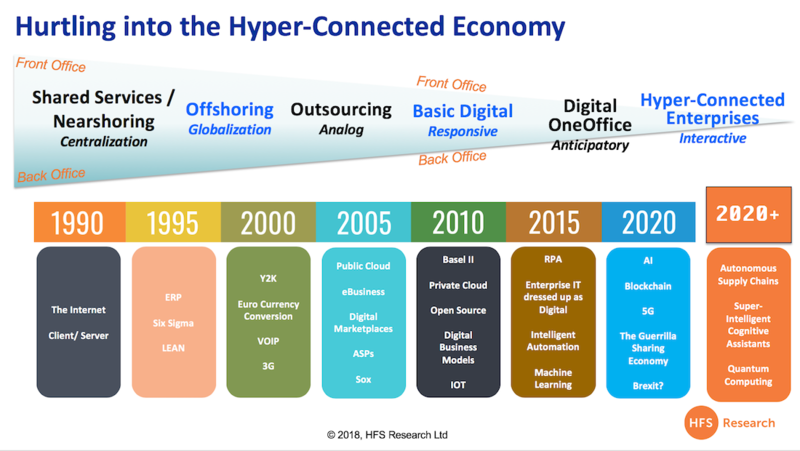 As the Hyper-Connected journey illustrates, it took 30 years to get where we are today - and that's because both front and back offices needed to go through major, secular changes to become efficient and digitized. But the next phase is not a trade-secret - this "Future of Work" is merely a phased transformation of the present. Dumb robots evolving into intelligent assistants... ineffective supply chains plagued with manual breakpoints becoming fluid, autonomous and intelligent - with the ability to interact with other supply chains. Quantum computing and blockchain emerging to challenge the very logic of TCP/IP and computing architectures. But to get there, we need to be experimenting, tinkering, exploring and disrupting with the kit that available today to get our organizations in a place where all these far-flung innovations can have some real possibilities. So let's have less talk about the future of work and focus on the present... we know where we are and what we need to do. So let's do it! Well articulated Phil. It is perhaps good for “automating” human actions where processes are broken. It will be good to see how fixes like RPA will give way to true Process integration softwares. Can RPA be used to monitor stock price movements and execute trades on broker platforms ? Nikhil - Yes. It can be. As always it is wonderful to you hear your version of all the noice around, Phil. But just from what UiPath is claiming ~100 million in yearly subscription fees from licenses and looking at the speed at which they have scaled, what do you think is a right valuation for them ? What money would you shell out for a stake in their pie? @Michael: The price to sales ratio for S&P 500 is at an all time high at 2.3 compared to 30-60 for RPA products. I am no investment expert, but something's not right here. Excellent article and kudos for calling out these risks of overhype. When expectations for technology products are far, far removed from reality there is only one outcome. Phil, Great article. However just to add to the discussion, I do see another potential for RPA tool. With its ability to process data both from UI as well as Data and Service layer it can become the enterprise orchastrator in a enterprise IT landscape. Also with the progress of custom configurable UI getting integrated with some of these tool for human response and data capturing, it has a potential to become one solution for all bpm and integration need. Specially with the smb sector where too many point solution liscence cost and diversified skill management for multiple point solutions is an issue. Would love your thought on that. I believe that RPA will be the path way to next wave of BPM and Cognitive automation. This is where platforms like Pega will have a leg up. RPA has a place but the benefits are being inflated , organizations are not ready to change, patience is little, and talent is sparse. This is making RPA programs hard to scale & succeed. Writing my latest LinkedIN blog, we estimate that 1.1 million jobs have been automated by the big 3 RPA vendor technologies to date. To test your valuation theory using DXC as a proxy - market cap of $27 billion and 177,000 employees equates to $167,000 of market value per unit of labour. Applying this to the 1.1 million units of work now being performed by RPA equates to $161 billion of proxy market cap. This compares to an actual valuation of Automation Anywhere, UI Path and Blue Prism of approximately $9 billion. Furthermore, with 85% of early RPA adopters owing less than 25 licenses each versus the 15% having reached the 1st level of scale with 300 licenses then it is clear that there is huge growth upside for the increased penetration of automation. McKinsey have stated that more than a third of firms have yet to get started on automation. Whichever lens you look at valuation through the conclusion is the same namely that the valuation of the big 3 has serious upside. It is only a matter of time before giants such as Microsoft, AWS or Google decide to make an M&A move so as to lock-in the massive digital workload onto their cloud platforms. Great article Phill. Been to AA's annual conference that took place this week. What I heard from multiple discussions that future of RPA is in AI. (Again, these are just predictions and probabilities people were talking about and now a days relating everything to AI is a fashion.) Is because of the ability of RPA to grow into AI and see the real use cases, make valuation of RPA companies so high? Phil - the only thing I would add to your excellent analysis is that xompanies are not static. The “big three” with their cash and equity war chests now have an opportunity to transform themselves and move beyond the meager beginnings of RPA into a richer future where they do become essential platforms for enterprise transformation. It is a treacherous road ahead but I believe this is actually the bet that venture investors are making — not in RPA alone but in how RPA can open a new door into enterprise spending. The warnings are excellent though because unfortunately there are companies believing some or all of these seven falsehoods and this will lead to a disillusionment and backlash against what otherwise (used appropriately) is a valuable addition to the enterprise toolset. RPA on it’s own is very difficult to use to automate complex decisions / monitoring tasks without consuming external decision automation and pattern recognition services. I asked this question months ago when you posted about Blue Prism being valued at $1 billion. Everyone ignored me! Spot on with all 7 and RPA without a clean up of the underlying processes just pushes the dust under the carpet and customers still get bad outcomes..
Nice Article Phil Fersht! As always honest assessment...hopefully every player in the game maintains this growth and not fizzle out..
Great challenging article from Phil Fersht. This is one for the diary. The RPA moons that circle 20th Century behemoths with the promise of rapid digitisation are they false prophets? Of the 13pc of enterprises that have scaled hashtag#RPA how many have self embalmed legacy processes. RPA is only one tool in your automation toolbox. Clear out the waste and radically simplify your processes before automating. A very thoughtful and insightful piece Phil. RPA has been a major game changer in the world of operations and outsourcing.... but $3 billion valuations of software firms barely hitting $50/100m in revenues? We don't think so... let's learn to keep nurturing this great business and not squeeze it until it breaks. It does not need this massively overhyped level of expectation - it takes time for clients to learn how to plan their people and processes to get this right and we have demonstrated the real data that educates the industry - which I will be sharing next week at the KPMG IA summit. At HFS, we believe strongly in the value RPA is bringing and can deliver and have been knee deep with the whole development of this industry for six years. But if we hype this up too fast to too many of these investors, this could crash and burn faster than any dot-bomb. I have loved observing and being involved in this space since I helped introduce it to the world in 2012 and want a long-term successful growth path for this industry: https://www.horsesforsources.com/robotistan_011112. I vividly recall lots of naysayers 10 years go saying essentially the same things about VMWare when they had roughly 5% enterprise adoption across their customers. Yes, customers were just dipping their toes for quite a while. Now look at their adoption. Same eith RPA, you’ll undoubtedly see the adoption grow across the enterprise as these products mature, and as the customers get more comfortable with them, and customers increase their proficiency in them. As somebody noted above, these companies solution offerings are not going to stay static either. They will add functionality and they will use their war chests to acquire/build next gen capabilities. While your analysis is valuable, it might be misinterpreted as to be suggesting that the 3 RPA vendors and the many practitioners/ customers are unaware of these ‘misnomers’. In my interactions with the founders/leadership of atleast one of the 3 companies, they recognize and acknowledge the first 6 points and have the right vision and roadmap to address them. Also, none of the 3 companies claim anywhere in their proposition/website or messaging that RPA replaces humans, or that it will be easy etc. - they all know that RPA is the beginning of the intelligent automation journey for them, and their customers. The question is how long does the “old system” last - and my sense is quite awhile. @Anon - I 100% agree that a big part of the value of RPA is to breath new life into old systems that enterprises simply cannot afford to replace. Most operations leader will tell you "Some legacy works, it's not worth phasing it all out immediately". My view is to figure out what is NOT worth automating from a cost/resource v value perspective; then decide what legacy systems to patch up with RDA/RPA; then ensure you ring-fence future investments in the legacy systems, excluding the cost of the bot licences and management; then evaluate what new systems/platforms you need to invest in, bearing in mind you need bots with excellent APIs / integration capabilities so they do not hold back your intelligent automation roadmap. Regarding valuations, I have a hard time seeing all three of these products going past $250m revenues - am sure one of them will. So we may eventually see one of the go for ~$1.5-$2bn (at a wildly optimistic best), but not all three of them, and we would need this hype phase to keep rolling on, which is unlikely. Meaningful and honest perspective on the reality of RPA. Phil - kudos for this brave and VERY REAL posting. RPA only exists as the industry it is today because of you fantastic research articulating the value and risks/challenges. I 100% agree that we need to tone down the hype - some of the garbage people who are trying to leech of this business is - as you say - insane. Realism and sanity. Thanks Phil for keeping us focused. Phil - best post on RPA for many years! RPA is now embarked in the financial bubble that hit AI technology providers 2 years ago. Phil, While I agree on the whole RPA and absolutely loved your "bandaid software" wording, The valuation from investors perspective might be justified for MSAs these companies have with many large enterprises. As they are in side the door, these large RPA companies can now evolve towards Intelligent Automation features like AI and Natural Language Processing. Automation Anywhere already started IQ Bot. However, AI being driven largely by open ecosystem unlike any proprietary software categories before (Oracle Database, SAP ERP, Salesforce CRM etc) - these guys might not have edge against huge open AI community in solving enterprise automation problems or go against biggies - Google, AWS, IBM or MS Azure who have huge AI portfolio and investments. So future is not so great for these guys unless they do something dramatically different or get lucky big time. What say on Intelligent Automation future? Are any of these companies (UiPath, Automation Anywhere, Blue Prism) profitable? @John Gugar - does it matter? Are Netflix, Uber and Tesla making profits? This is an insightful piece, but there are a lot of fallacies at play here. Growth investing is not the same as typical investing. If you can only look at this through the lens of a value investor, you should certainly not buy into any of these valuations. While you're at it, don't buy into any growth company's valuation, either. This reminds me of when people were shooting down Amazon (whose profits and valuation depend almost entirely on enterprise cloud services) because the multiples were crazy for a nascent technology with low run-rate sales. Where are those people now? Even Warren Buffet got on CNBC recently and realized his mistake. 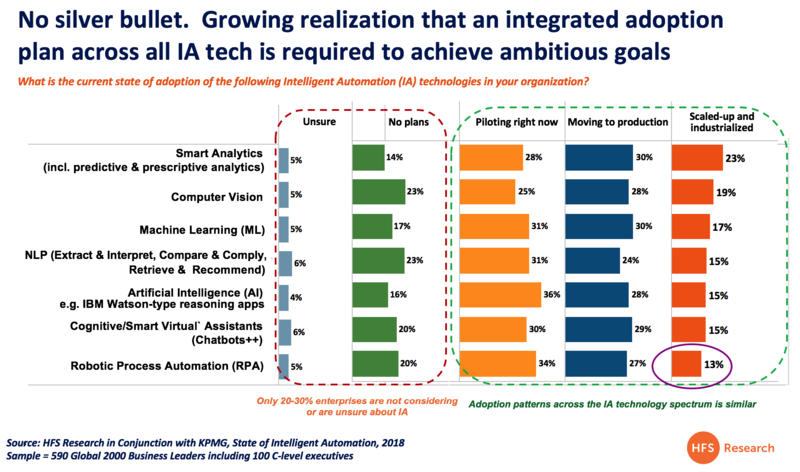 This is not to say RPA is the new Cloud or that any of these companies is the new Amazon, but to illustrate the point that enterprise technologies that transform how companies operate, as automation can (according to E&Y, ~60% of automation potential in an organization is suited not for AI / ML but simple RPA), are worth quite a lot. True RPA should scale globally, across multiple industries, and in virtually every function. I see many large, sophisticated companies like Prudential (http://info.blueprism.com/blue-prism-cafe-november-2017) and Coca Cola (http://info.blueprism.com/blue-prism-cafe-coca-cola) testifying as such. If certain RPA initiatives aren't achieving the right results or scaling the way they should, maybe the people in charge of them should question if they have the right vendor, partner, and strategy. As with any enterprise initiative, some companies do it right and some companies just don't. "Realism and sanity" would be to base investments after reality as it is and will be, not as it was. Multiples tell you about the past, not the future. As investors, we inherently have to look at the future (are you seeking returns from 2017 or 2027)? First decide if you want to be a growth investor (perfectly valid if you don't, but realize it's a different ball game if you do), and then try to figure out who owns the future, and invest accordingly. What matters much more than "run-rate revenue" for a rapidly growing software company is the market size (in this case: huge), its profitability (in this case, high), how much of that market the company can reasonably conquer (it seems like a 3-way split is likely given current trends and high switching costs), and the present value of that based on some expected IRR (exponential sales growth moves this figure higher vs. linear growth). There's a reason sophisticated VCs see value here, and the figures don't seem so crazy to me as an investor (companies with similar sales and negative gross profit (vs. ~98% for RPA companies) are valued at more than $3bn+ in Silicon Valley). Funny that you picked those names as example, given all 3 of them have recently had their valuations questioned in major ways. For a value investor, they should absolutely matter. For a growth investor, they probably shouldn't (unless the answer is they can NEVER make money)--but then, a lot of your other points shouldn't either. Unlike Netflix, Uber, or Tesla, RPA providers don't need to constantly create new content (R&D is pretty slim here), split their license fees with contractors (100% license revenue to the company), or keep producing new products to keep their revenue steady (bots should work perpetually once set up and are costly to replace), so nearly 100% gross margin (as we've seen from the only public vendor) is not out of the realm of possibility. Who cares what they're paying in marketing or sales when we all agree this will all peak at some point soon? I see RPA getting comoditized fairly soon, it would help to see some new players entering the market that will challenge current industry leaders who have become narrative creators - which is mainly hype and marketing. There's already a heavy fight across consulting industry, margins are squeezed as bragging about 'digital workforce' no longer guarantees multiple half-baked PoC projects. Sumanta, RPA processing Data, API's and service layers is an oxymoron - anything can integrate with these layers and has done for years. If anything, it will be the other way round. Robots will be the poor mans integration until the API's / integration are done properly. No serious enterprise architect would agree that RPA is anything other than tactical (and not a bad tactical) for this and using it to consume enterprise grade API's whilst OK, is NOT strategic at all. Re SMB's - the cost of doing RPA right is still too high. The UI's in the apps are getting more complex and the core "open source" RPA technology from Microsoft (search google for Mircosoft UI Automation), is not getting any better. Re your other point about new designer UI's being embeddable in RPA, again is very important but it's not new, it's been around since 2002 or before even. It's critical for attended automation though and why we've supported it from day 1. Now, we have the no-code technology for building the new UI's/serious enterprise apps that work in unison with RPA, it's easier to bring the tactical RPA into the DPA movement. Mike, your research is seriously flawed and I have no idea how this hype persists. I've been in "RPA" since before the year 2000!. I deal regularly with most of the larger companies (at the exec level) who have either successfully or not, got RPA to scale. All using most of the top 10 RPA vendors. AND - even companies with > 100,000+ employees. Backing up Phil's research, the number of companies that have reached any kind of scale (Deloitte say < 4% have more than 50 bots!) is tiny. One bank told me, after 7 years with one of those top 3 vendors got them to 200 RPA bots, no FTE savings and it's deemed a fail (and they stopped). Microsoft already own the core technology of RPA (it's called UI Automation) and all of the vendors use this or a 3rd party OCR product to scrape. Why would they buy it. And what enterprises are moving their existing clunky legacy desktop apps to the cloud platforms? the opportunity with Citrix to do that has been around for decades and RPA is no more a driver to doing this. New systems yes, old systems, it's an architecture / security nightmare and RPA doesn't solve any part of the problem. Your points on scale are valid but your big assumption on the upside because of where it can go misses the major point - that is - MOST of these companies have been trying to do this already for years (10+) and not finding the promised holy grail. RPA is NOT easy and can only be successfully when it's part of something bigger. RPA vendors were clever at claiming this was all new when the "ROBOTIC" term was added but most analysts realize, this was the biggest myth of all. RPA scale and success comes only when it's part of something bigger - and even then, as a tactical bridge to the elimination of the legacy stuff, once and for all. And Phil, spot on again. Perhaps to help your readers, you could mention what "scale" means and it's then relevance to the size of the organizations that have scaled (and those that have not) over time. RPA attended has scaled and is a different beast owned by only one or two vendors (none of the top 3), but RPA unattended scale, after 10+ years is almost a joke. Perhaps why the top 3 seem primarily focused on the race being about "number of new customers" instead of numbers of seriously successful scaled ones. And i read some common sense here. In 2016, when we sold OpenSpan to Pega, it was because we already knew that RPA needed to be part of something bigger. The entire DPA, One Office, IA movement (or whatever you want to call it), is because we cannot keep scraping the scrapers of technology. It doesn't work. Using tactical RPA to drive "time to value" to true Digital Transformation is the only path to success but believing RPA will ever be strategic is ludicrous. It is also why now, when you buy into DPA, we give you all of the RPA bots (attended and unattended) you need for no additional charge BUT if you want to start with RPA first, that's OK too because we also provide it on a world leading DPA platform. Whilst the other RPA vendors are trying to partner with other DPA companies to get a more robust platform (or building their own to compete), they are struggling to get their RPA clients to scale but doing a great job of convincing analysts it's just a numbers (of customers) game - when it's clearly not. Phil is spot on here, whilst I believe the real wave "terminology" is DPA, and Forrester puts RPA at just 7% of the total value of DPA, the RPA vendors do not have anywhere near the depth of technology of the bigger DPA boys. The assumption is the RPA vendors will be the companies that bring strategic "IA" into their RPA enterprises that they haven't even scaled in. This is NOT any serious "inside door" by any stretch of the imagination. Great article as usual Phil! The number of people execs saying “we want to see what we can do with RPA” is painful. Yet again we have a TLA tech (CRM, BPM...) where those who lead with a hammer will assume everything is a nail with some terrible results. Having worked in an immature industry sector back when workflow and BPM were emerging, I remember seeing salespeople (understandably) going in with the attitude “whatever the process problem you have, BPM is the answer”. This led to some very bad decisions. The only organisations that are making anymore than sticking plaster fixes with robotics are those that have it as part of their suite, not their sole proposition. Thanks for "RPA is a BandAid, not your new enterprise platform.". Uipath, Blue Prism, AA and other paid RPA solutions are selling you your laziness.. Try to learn one of open source script languagues for automation like Autohotkey, Autoit,... and you will be freed from them and you will have RPA solution with amazing ROI because you only pay for your employees, nothing more. I have try them all so I am talking from my experience. Very insightful article Phil Fersht, the challenge today is that the ROI from investing in RPA is squishy at best. The need to see hard tangible $avings in short to mid term post implementation makes it pretty challenging to hit and maintain those revenue figures. Well articulated. Your scepticism is spot on Phil. And your reasoning is entirely valid. In addition, and speaking as someone who actively invested, built, managed and eventually lost my shirt in the dot com boom to bust cycle in the early noughties, I do believe it is easy to get caught up and believe the hype that surrounds the “next big thing”. There’s a lot of money out there seeking to be part of the current wave. When the so called “smart money” investors arrive, it can be a small step from believing one has a bright idea to being convinced one is a visionary, regardless of the market adoption challenges. But then again, much of this money is coming from investors with deep pockets who are taking a punt on the future. I doubt any of them are betting the farm. But if they are not in, they can’t win. Besides, history is littered with over-hyped investment cycles. Is this any different? This is a reality check which poses a great counter to the slew of pundits predicting a sudden death of many traditional and time tested operational frameworks - still, I wonder why any entity that responds to any survey on RPA as unsure or no plans have a perceived "lower" status and mind share and a tag of "not doing enough" to be "in the league". Valuation per FTE and the value of BOTs using the number of jobs it has taken over can work only when there is a demonstrated zero failure rate and actual ROI that reflects in the OPM. Else risk will significantly alter the model. RPA revenue model has a "revenue per BOT deployed" and mirrors the "cost of BOT deployed versus the cost of FTE actually saved , either by redeployment or redundancy which is built into the investment case of a customer of such companies. hence, this is a 2-sided valuation story, and the valuation of the client is closely linked to the valuation of the RPA company. Not sure if this linkage and analysis is available thus far, it would be great if that can be shared by anyone. The critical element of the valuation model is that the success rate of a BOT has a significant impact on the growth story. Not sure if the valuation arrived at by the various firms have a risk embedded in them for the failure rate - since all processes are not watertight to support a success rate embedded in the valuation, I suppose. All in all, this is a very exciting phase to follow and our times are the best ! This is exactly the approach Redwood has taken. With 25 years experience in Automation we have been able to natively connect to the back end systems as well and drive UI when needed, within a single solution including entire process orchestration, , workflow, SLA management and auditing. I can send you some use cases if you’d like to see more how this translates into reality for businesses. Recently replaced a complex rules based process (700+ rules in excel). Rather than wrap this legacy minefield in a robot, in < 90 days, it was rebuilt with a lo-code platform. What I love about RPA today is, when it fails, as it frequently it does, it finally opens the door for the more serious conversation about the OneOffice / Digital Transformation discussions. RPA exposes not only the weakness of RPA but makes business realize, they have to look wider and deeper if they want to play in the digital world.